(Juneau) – The Alaska Department of Fish and Game (ADF&G) has completed compilation of preliminary values for the 2013 commercial salmon fishery. Powered by a record pink salmon harvest of 219 million fish, this year’s harvest ranks as the second most valuable on record. At $691.1 million, 2013 is only exceeded by the 1988 harvest value of $724 million. In addition to setting a record for pink salmon, the total number of salmon harvested also set a new record at 272 million fish. Sockeye salmon narrowly held onto its position as the most valuable salmon species harvested in Alaska’s commercial salmon fisheries, with a statewide value of $284 million. Almost half of this came from Bristol Bay, where the price was up even though the harvest was modest. Pink salmon, riding a huge wave of production across multiple fishing areas, brought in $277 million. Chum, coho, and Chinook salmon, respectively, filled the remainder of the ranks. Bristol Bay, usually the most valuable salmon fishery in the state, fell to third place this year behind Southeast Alaska and Prince William Sound. Southeast and Prince William sound realized the largest pink salmon harvests ever recorded in their management areas; just over 91 million pink salmon from Prince William Sound, and 89.2 million pink salmon from Southeast Alaska. This year’s title of most valuable salmon fishing area in the state belongs to Southeast Alaska, with an all- species harvest value of $219 million. In addition to the $124 million in pink salmon, Southeast chum and coho salmon yielded values of $43.6 million and $23.4 million, respectively. In addition, the Chinook salmon harvest in Southeast Alaska was worth $17 million. Kodiak and Chignik also had very good years with all-species harvests worth $61 and $23 million, respectively. For the first time in several years, the Alaska Peninsula also enjoyed a decent pink salmon harvest. The Yukon and Kotzebue management areas had good chum salmon returns, but Chinook salmon returns throughout the Arctic/Yukon/Kuskokwim region were again low and provided no commercial fishing opportunities. 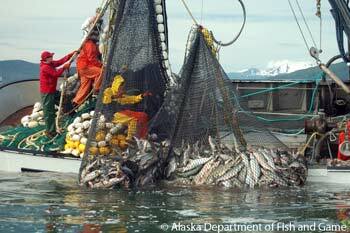 The Upper Cook Inlet sockeye salmon harvest was just over half the forecast. Management restrictions on the sockeye fishery were required to conserve a small Chinook salmon return to the Kenai River. Values provided by ADF&G are based on estimated ex-vessel prices and do not include post season bonuses or price adjustments. The final value for the 2013 salmon fishery will be determined in 2014 after seafood processors, buyers, and direct marketers report the average prices paid to fishermen in 2013. It is entirely possible that after final prices are determined, the 2013 season, without accounting for inflation, could surpass 1988 as the most valuable salmon harvest in history.